I don’t think I’ve ever met anyone who didn’t like Telluride, Colorado. If I had to recommend one Colorado mountain town to visit, it would definitely be Telluride. There’s a little something for everyone to enjoy and how could anyone resist a place where there’s usually a herd of elk in a meadow on the edge of town welcoming visitors to the area? We’ve had the pleasure of visiting this charming mountain town a few times over the past three years and each visit was truly a joy. First off, Telluride is beautiful. It sits in a canyon surrounded by steep forested mountains and cliffs with the stunning 365 foot Bridal Veil Falls seen at the far end of the canyon. 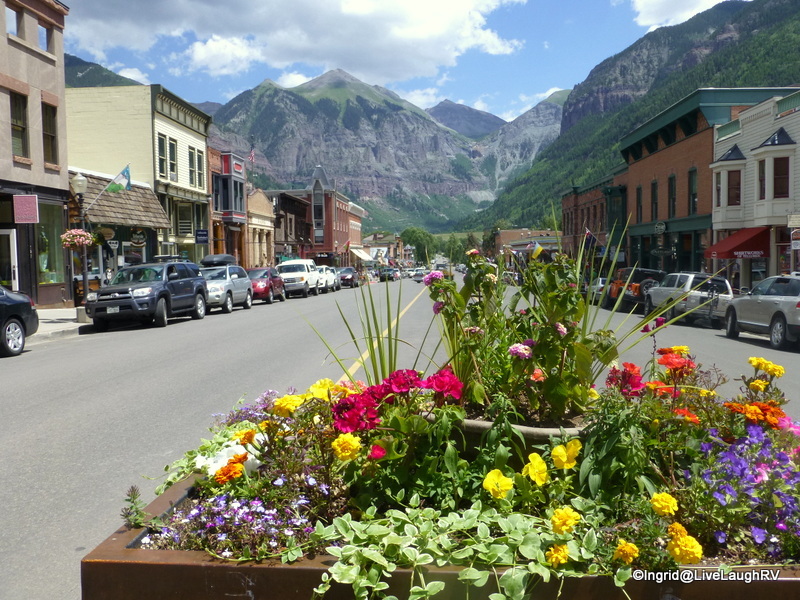 Although Telluride is well-known for outstanding ski slopes, the summer months have actually become more popular with tourists as the town hosts a variety of festivals (including film festivals) and endurance events all summer long. 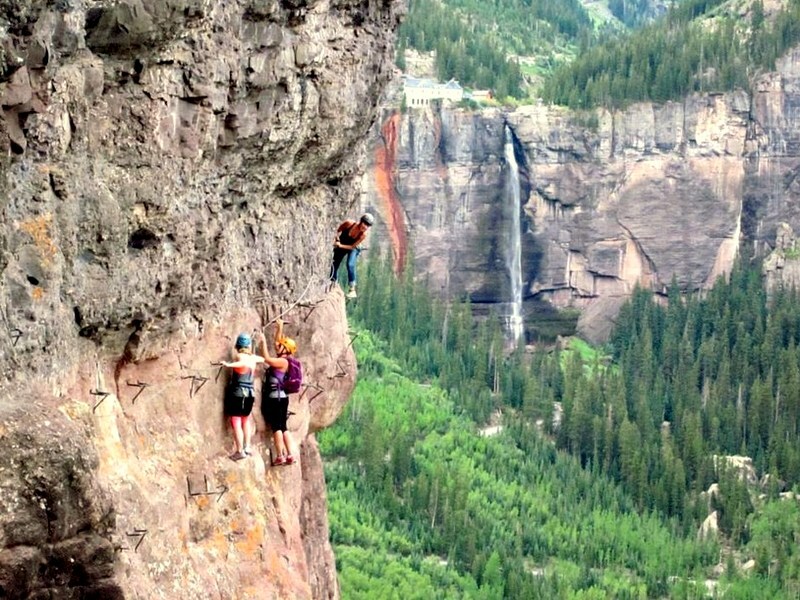 The outdoor recreation is fantastic and even offers extreme hiking: Via Ferrata. There’s a hiking trail that allows one to wander from town all the way out toward Bridal Veil Falls. The houses passed along the way are unique and delightful. Tidbit: The famous bank robber, Butch Cassidy, committed his first recorded major crime in Telluride by robbing the San Miguel Valley Bank in 1889 and exiting the bank with over $24,000. 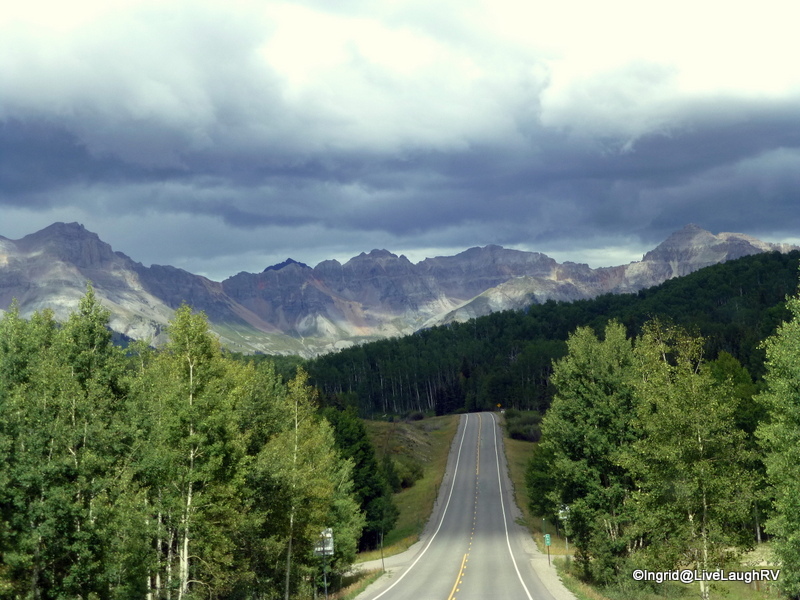 This charming Rocky Mountain town located in southwestern Colorado is most definitely worth a visit and goes to the top of my list; Top 5 Colorado mountain towns. The town boasts a population of less than 3,000 and sits at an elevation of 8,750 feet. We’ve enjoyed hikes to Bridal Veil Falls, shopped the Friday morning Farmer’s Market, and loved the free Gondola rides; a bonus not to be missed. Previously we’ve taken a back country 4×4 road to get to Telluride. You can read about that excursion here. We’ve eaten at several tasty restaurants, met fellow blog followers for a brew, and generally savored the vibe and beauty that is quintessential Telluride. I can’t wait to return! Camping: Whenever we’ve visited Telluride, we’ve camped at Ridgway State Park, about an hours drive away. 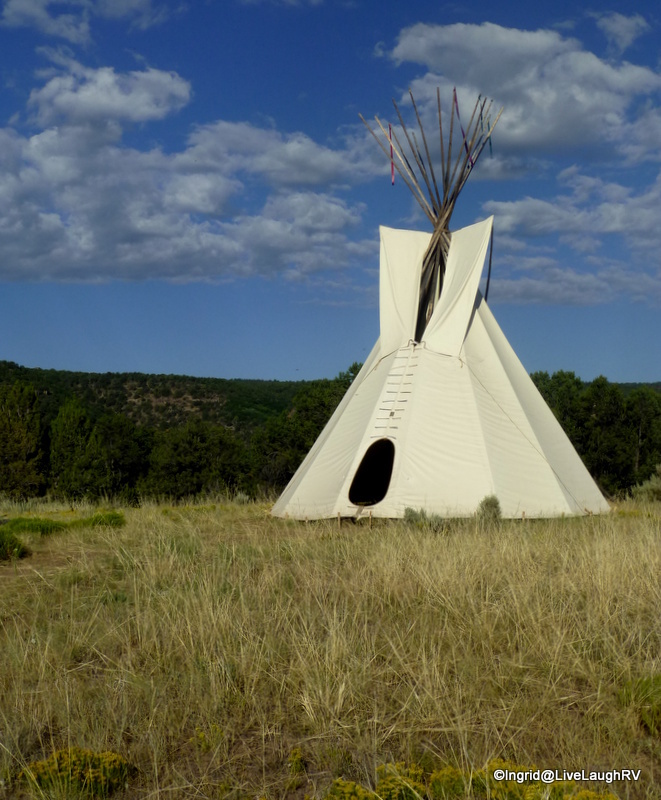 The park offers sites accommodating tents and large RV’s alike. Ridgway State Park is one of our favorite campgrounds. I did a post on the area a while ago and you can find it here. 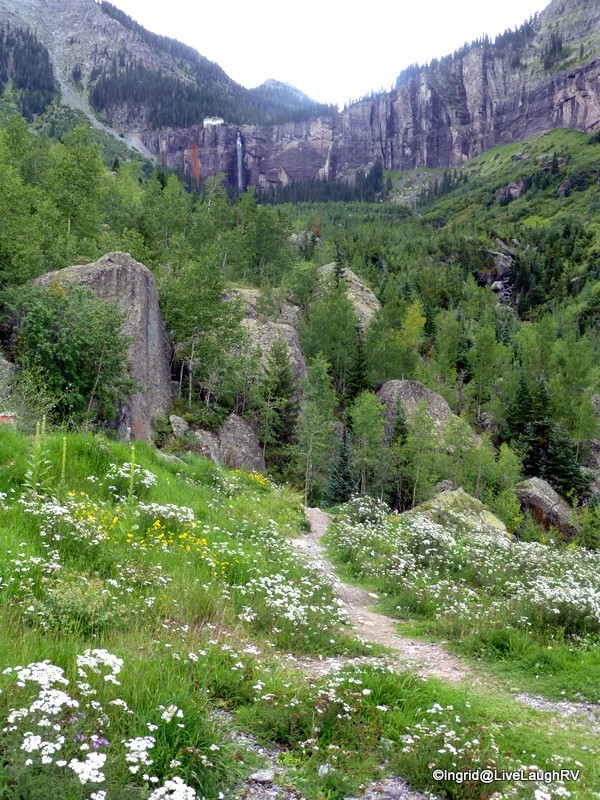 Much closer to Telluride is a delightful National Forest Campground; Sunshine Campground. 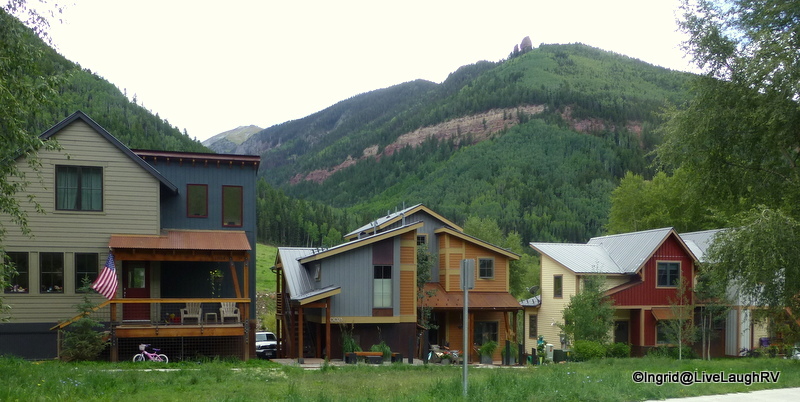 We would love to stay here due to its stunning views and near proximity to Telluride. It’s super close to Mountain Village where one can park and catch the free gondola taking you up and over the mountain into Telluride. Unfortunately, we might only fit into a couple of sites and the turning radius to navigate into and around this campground is tighter than our comfort level allows. Further down the road is the Matterhorn Campground, also a National Forest Campground and this place can accommodate just about anyone. For those traveling with tents, vans, or small RV’s, the perfect place to camp to really immerse oneself into the Telluride lifestyle is the Telluride Town Park Campground. Nestled in a grove of pine trees along a creek, it’s within walking distance to festival venues, restaurants, and shops. Obviously where there are trees, there are low branches and tight turning radius’. Thus, not an option for us. Once again, small RV’s have the advantage. Note; during festivals this campground is jam-packed making it difficult for even a Honda Civic to navigate. Took my iPad into town to find a free wifi location & catch up on your blog. So glad I did! I appreciate the info I gleam from it & love the scenic photography. What a beautiful area to visit! I read your post the last time you were there, now this one and I still haven’t gotten there yet!! Maybe next year we shall be headed that way!! Thanks for the info and beautiful pictures! Telluride looks very charming. It reminds me of Banff, have you ever been there? Seems they have a lot of the same features, being small rocky mountain towns surrounded by the stunning beauty of the rockies with endless adventures. Telluride is one of the intriguing places to visit listed on the book my mom gave me. With your personal experience it is all the more reason to visit it. Again this is just perfect timing as we will b spending more time on the west next year. Thank you for all your round up Ingrid. That is the one downside to having larger living accommodations. However, Matterhorn and Ridgway are both lovely places to camp. I would think you’d enjoy that festival along with the Friday morning farmer’s market. 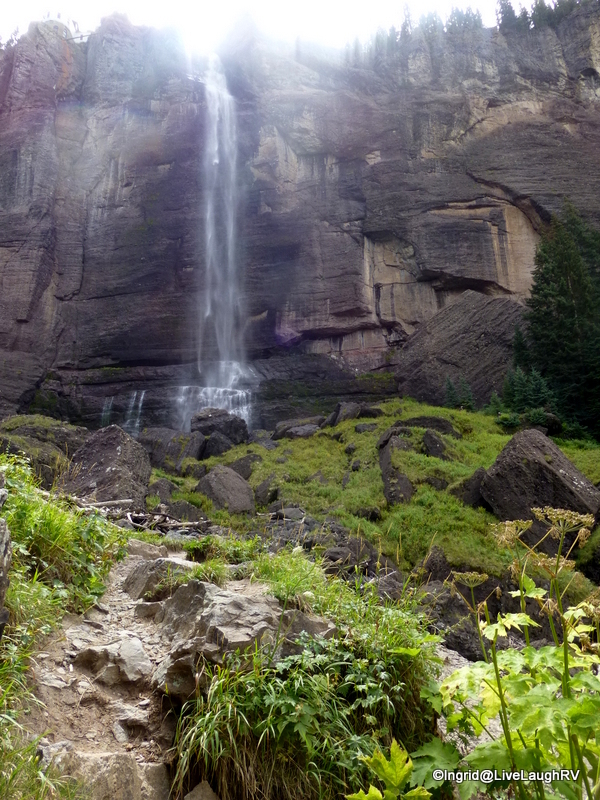 Telluride is definitely a place you two should visit. We live just 4 miles south of the Colorado border and have done the Enchanted Circle (Durango, Silverton, Ouray, Ridgeway, and back down the back side to Cortez) both as a day trip and as a weekend getaway.One of our favorite restaurants is the Argentine Grill in Rico, just south of Telluride. 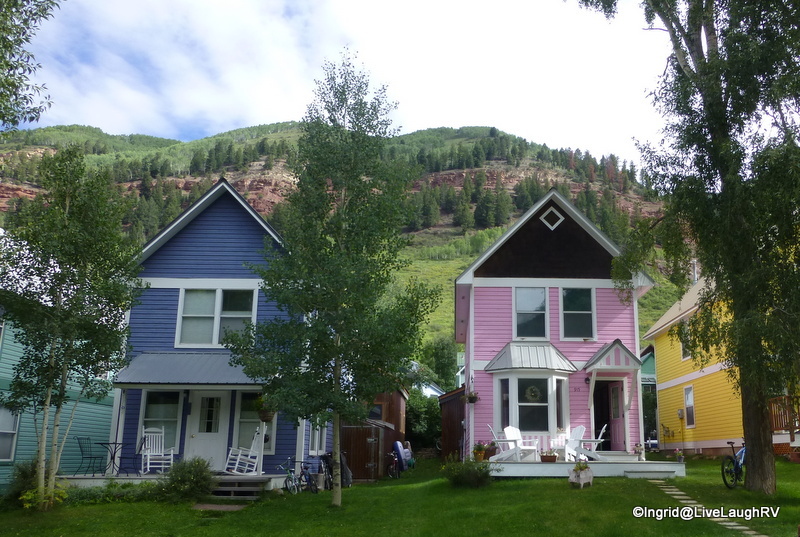 The owner wanted to get away from the Telluride rat race (!) so he opened this charming little place down the road. Reservations required. Also check out Olio in Mancos. Thank you so much for the campground referrals. Once we get on the road we’ll be taking a lot more time to get around the loop! Ouray along with Telluride are at the top of our list too Ingrid! And yes, a July visit offers beautiful hikes, rides, and weather! I think it’s just a little piece of heaven! Nice posts, I have enjoyed your pictures and commentary. The hummingbird in the last post is a beauty! Thanks for this post on Telluride Ingrid! I’ve managed to book a couple weeks at Ridgeway in August and look forward to spending some time in that little gem. We’re using Golden as a base to enjoy what the area has to offer, but Its fun to drive away and move further afield. I’ll use your recent blogs as good references! Hope we’ll get to see you while we’re all still in one state! Thanks for doing these posts and the photos are magnificent! I love this series of posts Ingrid, I can’t wait to visit Colorado! The via Ferrata looks scary but the views you get must be awesome ! Have you ever done it ? With Crested Butte, this is the other CO hill I would liked to have skied. I’m thinking we need to spend some time in the Rockies next summer. From your picture this lovely small town remind me Banff, Alberta, Canada. There is a lot of similarity. Both gorgeous! 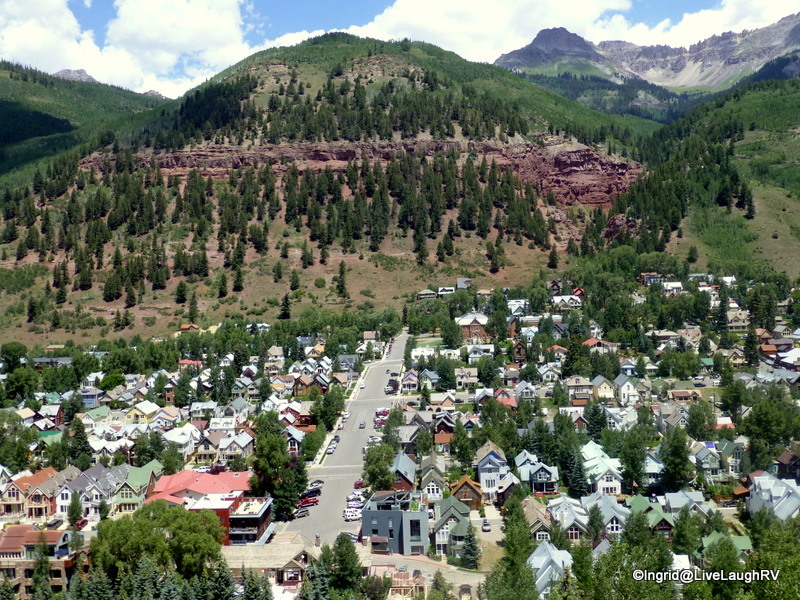 I really enjoyed this lovely overview of Telluride, Ingrid — and your beautiful photos show it off well. I love that first one with the flowers in the middle of the road. Thank you Jet. I loved the flower boxes placed in the center of main street (Colorado Avenue). I love this post and your top favorite Colorado town. I saw Telluride for the first time last fall and loved my first view of it from the roadway above. There are so many beautiful Victorean homes and buildings there. I will have to come back to see the wildflowers, and I would love to see a few shops. We bought our ranch house yesterday, just 5 miles from where we live now. We close on the new house August 13th. We plan to get a few handyman jobs on our current home before we put it up for sale. Busy, busy! We may be sticking around while I go to PT anyway. One of these days we will get back out! Happy Travels Ingrid, and I love your photos. Thanks Holly and congratulations on finding a new place. You’ll definitely be quite busy over the next few months. I’m excited for you. Hope you’ll share some photos of the new place. Ingrid, I’d say this is a perfect travel blog post (not that I usually rank these things). I’m just struck by it being just the right length, with just the right amount of appealing pictures, and is so informative about the location that I (your “typical” reader) feel both tantalized and prepared to head for Telluride ASAP. We have not visited Telluride for years but would love to go back. Great tips for the area Ingrid. With your nifty truck camper, you’d love camping in the town park; allowing you to walk everywhere. Make sure you visit after July 5th to be sure the snows have melted in the high country and the wildflowers have started blooming. Thanks for the tips Ingrid! That looks like my kind of place. What a beautiful area. Another must see town. We too loved this town. For camping I can also recommend Cayton National Forest campground, just a tad further down from the 2 you mentioned. That’s where we stayed and we loved it. Great round up of the area! Gosh Nina…. thank you for taking the time to comment. I’ve heard nice things about Cayton NF and will check it out next summer since we’re hoping to spend more time exploring Colorado’s western slope. Safe travels to you and warm wishes! Thanks Pam. Between all the 4×4 back country roads and scenic hiking trails, you two would be in your element. 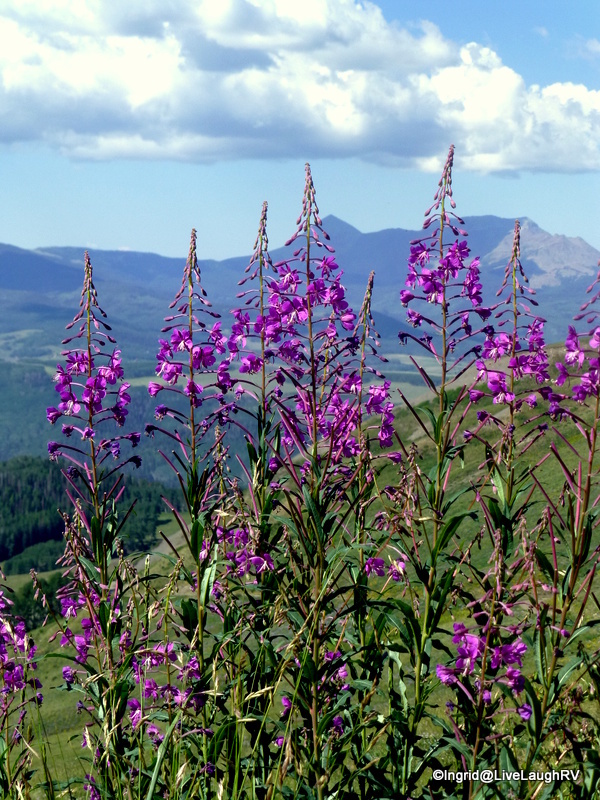 Hmmm, I could even see a fun Jessica visit to this part of Colorado and when the wildflowers are blooming – sheer joy! The US Federal government uses Telluride for scientific conferences. They rent out the ski lodges and facilities. We were invited there in 1993 and loved it. It doesn’t look like it has changed at all vince then. Enjoyed your top towns posts very much. Thanks! Your recent posts are pouring fuel on my desire to get to Colorado for a couple of months. We just have t been able to figure out a good schedule to do so, since it obviously is a summer trip. Perhaps we need to go for a whole year on the road, so we’ve got time for a bit of exploration to the mountain and west coast states. You are giving me a much needed nudge toward doing so….